Posted on Mon, Apr 30, 2012 : 10:20 a.m.
It’s a snap making quickie meals with thin pieces of chicken. Although the following recipe is a bit more involved — more along the lines of a piccata — chicken cutlets simply sautéed with leftover veggies also makes a good, impromptu meal. I’ve used the pre-packs of chicken cutlets in the past, but the pieces seem irregular; half the chicken is paper thin and the other often the thickness of a smartphone — it’s impossible to cook the meat to perfection. It’s so easy to slice a chicken breast through the center horizontally, especially if the meat is partially frozen, so why bother to buy the pre-packs, anyway? I selected Pine Manor young chicken from Whole Foods, which are more flavorful, juicy and tender than other brands I've used in the past. Bell & Evans and Maverick Ranch are other favorites chicken brands I use. 2. With a very sharp knife, slice chicken breasts horizontally, sandwich- style, through the center into 1/3-inch pieces. (Thick breasts may yield 3 cutlets.) Heat 2 tablespoons oil in a heavy-bottomed pan over high heat. Fry tomatoes, with a pinch of kosher salt, stirring, until they soften, shrivel and blister, 4-5 minutes. 3. 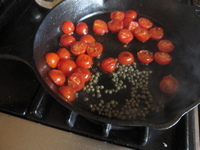 Add capers to tomatoes and fry until become crisp and slightly brown, an additional 1-2 minutes. Turn off heat and transfer the tomato-caper mixture to a plate. Reserve. Season one side of each cutlet with kosher salt and freshly ground pepper; dredge both sides in flour. Add an additional 2 tablespoons oil to pan and heat to medium high. SautÃ© the cutlets in batches until golden brown and just cooked through, 3-4 minutes per side, depending on thickness of breast, adding additional oil if necessary. Transfer the cooked chicken to an oven-safe dish and place in oven to keep warm. 4. Add garlic to pan and cook over medium-high heat 30 seconds. Deglaze pan with stock and wine and reduce, stirring bottom and sides of pan, until liquid is reduced by half. Stir in butter to add richness and thicken, if using. 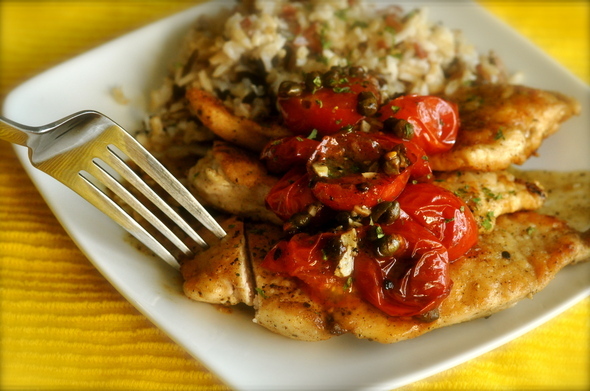 Stir in tomato-caper mixture, reheat, add the basil and parsley and spoon over warm chicken cutlets. Tue, May 1, 2012 : 3:24 p.m.
Pine Manor is another name for Miller Farms chicken, found at Busch's, Hiller's, Arbor Farms and other markets. Tue, May 1, 2012 : 1:34 p.m.
And where does the chopped basil or parsley come into play? Mon, Apr 30, 2012 : 3 p.m. This sounds good. I'm always looking for new ideas with thin chix. What is the quantity on the capers? Thanks!